A remarkable view drawn at the open of the American Civil War. Pictorial Map of the Seat of War, Showing Parts of the States of Maryland, Delaware, Virginia, and North Carolina, and also the Coast Line From Cape Henry to Fort Pickens, With the United States Blockading Fleet. 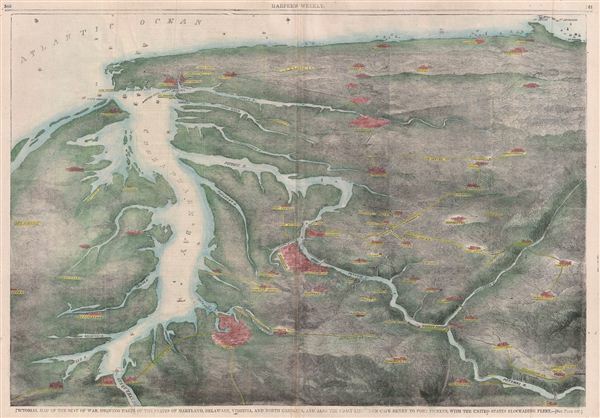 An uncommon and interesting view and map of the Chesapeake Bay and vicinity drawn just after the 1861 outbreak of the American Civil War. Oriented to the south, this view covers from the entrance to the Susquehanna River at Perryville and Havre de Grace to Cape Henry at the mouth of the Bay and Fort Jefferson along the Virginia Coast. The map includes the embattled cities of Washington D.C., Baltimore, and Richmond as well as numerous smaller towns. The Union Naval blockade along the coast and at the mouth of the Chesapeake is also in evidence. Possibly the work of Charles Magnus, this map was issued in the June 8, 1861 edition of Harper's Weekly. Harper's Weekly, June 8, 1861, p. 360-361. Good condition. Typical wear on original centerfold. Even overall toning.